While riding from Metropolis towards Springfield, Illinois I passed through the town of Vienna. It was a place I’d never heard of before. As I slowed approaching the stop sign at IL-146, to my right was the most beautiful ghost. 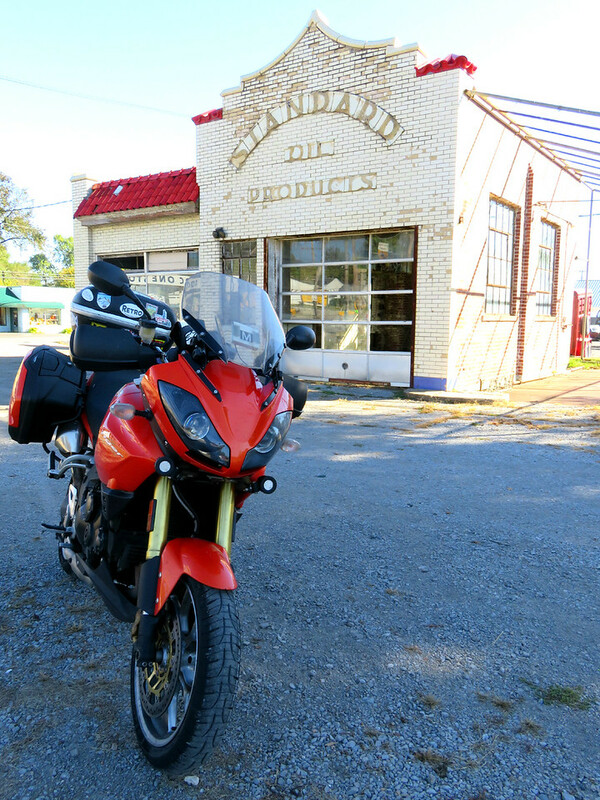 A Standard Oil station. Seeing it immediately made me wish I could have experienced it in its former glory. How could something so lovely fall into such a state? I’m sure it is a case of monies best spent elsewhere. Trying to survive will always trump everything else. Even so – part of me wishes that a preservation group could take this beautiful skeleton and return it to its original splendor. Can’t you imagine driving over the hose near the pumps and hearing the *ding-ding* of the bell? I suppose anyone younger than me might not even get that reference. Yesterday, I learned a new word. anemoia – n. nostalgia for a time you’ve never known. It’s definition came from the depressingly named, Dictionary of Obscure Sorrows. But I happened to read it while perusing the much less heartachingly titled Route 66 News. First, those are awesome pics. I am glad the sight of the sad derelict touched you enough to make you stop and capture some images. It would make a very cool restaurant/cafe. I am old enough to remember the ding, but am not sure I prefer the old full-service gas stations of yesterday. A lot of those places are really hard to sell as the new owner could inherit the contaminated ground from leaking tanks. But it still looks like a great building and location. You think? My only recollection of hearing it was from being a kid. I don’t recall ever hearing it while piloting my own car. What a great find, Fuzz–a diamond in the rough indeed–and well done snoopin’ around as you did. I often feel anemoia (now I know the diagnosis) for the 1940s–I don’t know why. My grandparents were in their primes, and radio was entering its golden age, but things were mighty tough as well, with the fallout of the Great Depression, and with WWII in full swing… Nevertheless, I believe that it’s there, er, then I really belong. And thank you, thank you, thank you for introducing me to The Dictionary of Obscure Sorrows. I’ve added it to my feed and will be spending some time there. I do love the old gas stations. Here in the south, many of them have been made into cafes and restaurants, as Kathy mentioned. I remember the ding…and I agree that I would not have fared so well in an earlier time, when things were much more restrictive for women. Also LOVE the grandiloquent word of the day page, thanks for sharing! I live in Vienna Illinois. 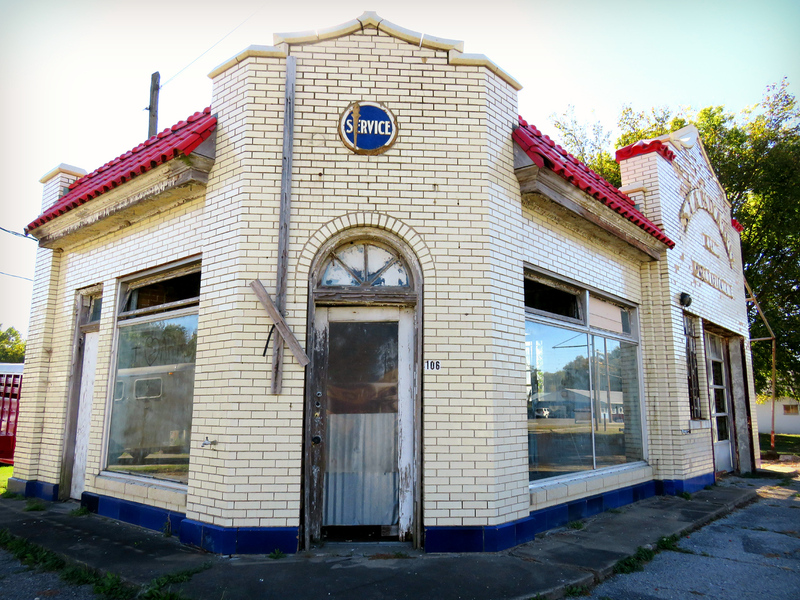 There are pics of the old station inside neds shed, a lol burger place across the street. I wish there was a way to restore this old building. 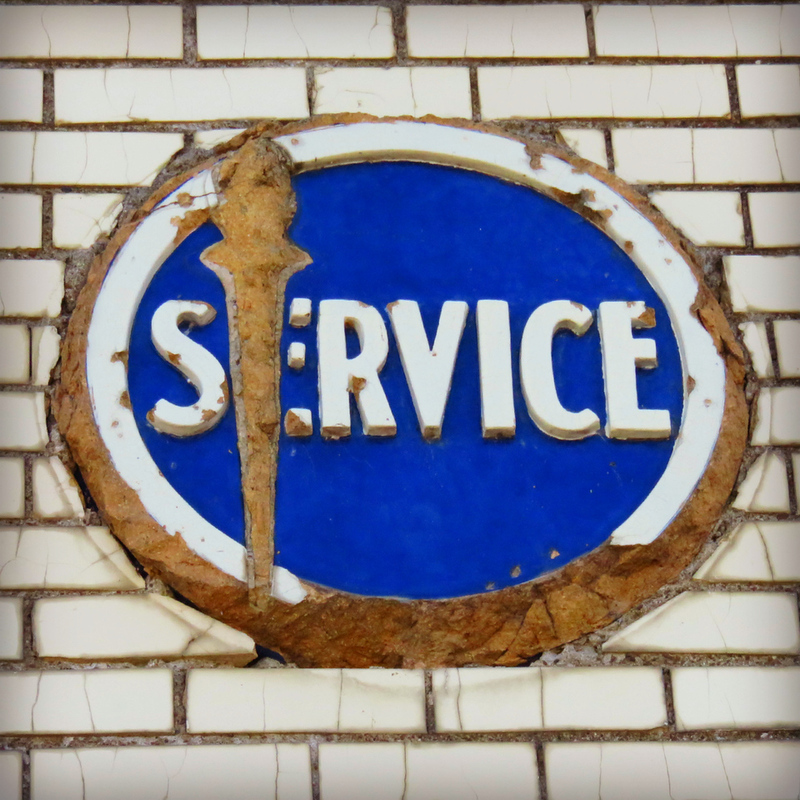 I’m old enough to remember that service station being in business… it wasn’t that long ago! 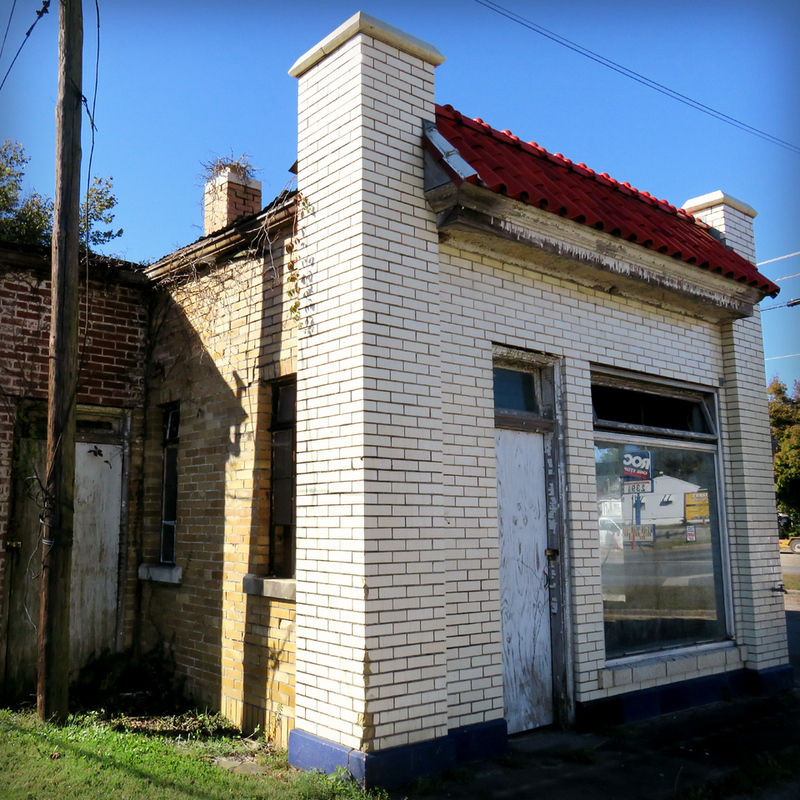 Many people have tried to purchase that old gas station. The problem has come in peoples inability to remove the old tanks buried underground… the cost is astronomical to most. Many people, including my own mother, have thought about purchasing the old station, to make a coffee/pastry shop, etc. It seems like there are lots of people who love the ole gal. Maybe… just maybe the stars will align base don such an outpouring of interest in it. Loved your post. I grew up in this town. I use to hang out there as my friend dated the owner’s son. I have tried for years to raise interest but there are just “no takers” if you will. 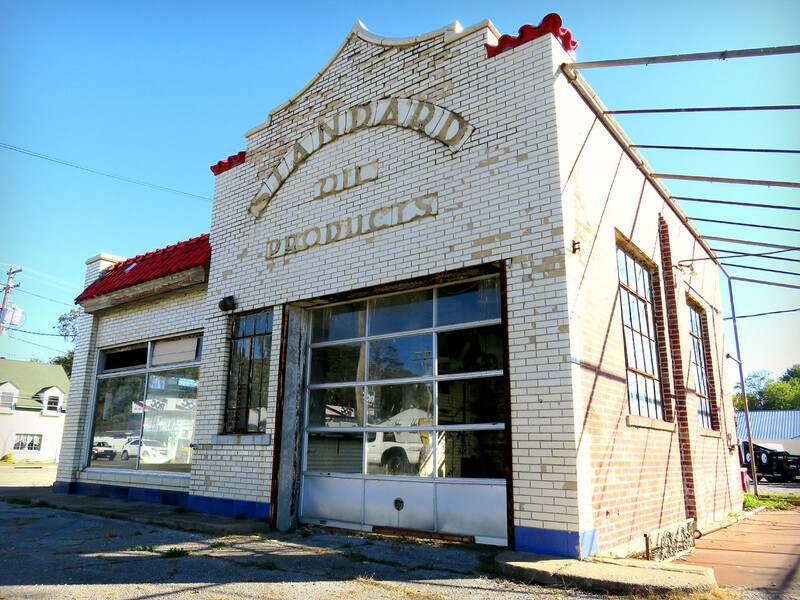 I wrote an article for the local paper telling its history of being built by the Standard Oil Company as part of a chain across the US at major intersections. I offered to form a committee to work on the issue. I did not get one reply. I know of a way around the issue of the tanks, said so in my article and again, no one asked me what I knew, not even one person. It is beyond sad! If you would ever like a copy of my article telling its history message me back and I’ll send it to you. Thanks for reading and commenting. I would love to read your article! Perhaps a preservation group such as: http://www.preservationnation.org or http://sca-roadside.org could assist or give guidance? My father was the last person who ran this station around 1976. He closed this one and moved out to the interstate being the very first business to open out by the interstate. I can remember as a kid spending many days in the old station trying to help out. I love this old station too. I think it would be great if it was restored. It saddens me every time I drive by there. I would love to do something with the building myself. It seems like people these days don’t value such buildings as these. They would rather tear it down and build new. It’s sad! By the way I love the pics. There seems to be an awful lot of people who care about this building. There seems to be so much interest in it. Perhaps a preservation group could assist or give guidance on saving it. I lived next door to this station as a kid back in the 70’s. So many fond memories! Harassing the workers, buying candy from the old coin operated candy machines. (Clark bars, Mallow cup-a favorite!) Not to mention jumping on the rubber lines to make the “ding, ding” sound over and over. Much to the workers chagrin…Fond memories here to say the least, and my vision too would be a full restoration! I can remember this station as far back as the early 60’s. And believe this one or not, I remember gas being 19 cents a gallon on the pumps that were in the front. What great memories and yes, a great restoration project!!!!! I have always wanted to see something like an ice cream shop in that building. It would be so awesome. The owner of the building when the red letters were removed, Cliff Mathis, told me that Standard Oil told him to remove the letters because of trademark laws or something to that effect. I don’t know why they would care since it was no longer in use. I personally think that leaving it in its original state would be good for Standard’s image. 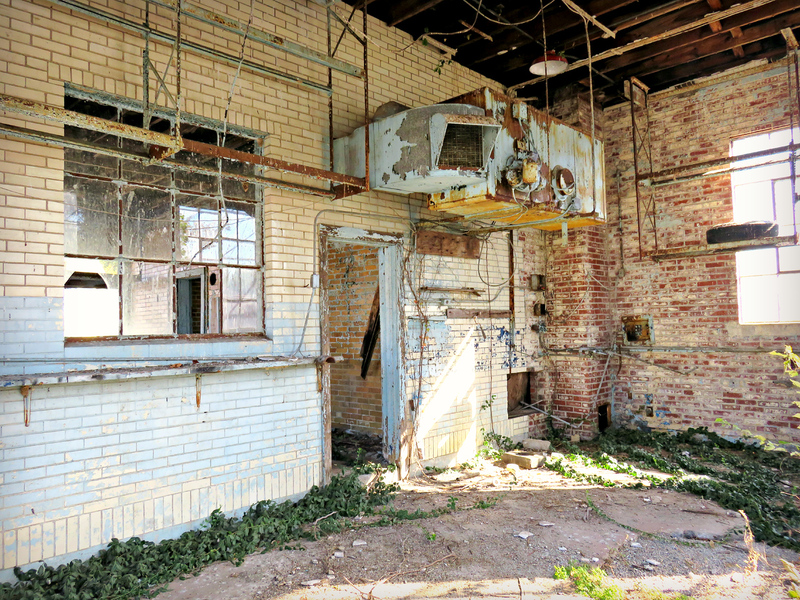 He told me that the shed on the south side of the building was added later and was used to service large trucks that would not fit into the service bay in the original building.